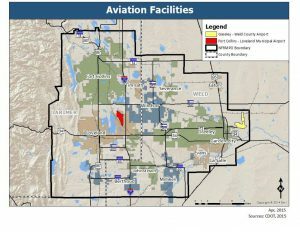 Two airports currently operate within the NFRMPO region: the Greeley-Weld County Airport and the Northern Colorado Regional Airport (formerly the Fort Collins-Loveland Municipal Airport). The Fort Collins Downtown Airport closed in 2006. Each of the two operating facilities is described in more detail in the sections below. 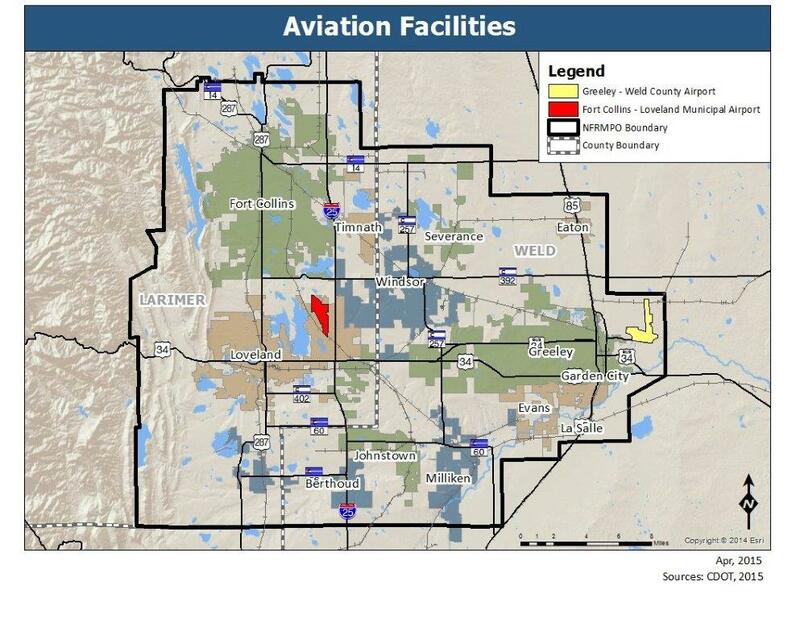 The Greeley-Weld County Airport (GXY), which covers 1,200 acres and opened in 1944, is jointly owned and operated by the City of Greeley and Weld County although financially independent from both communities. The airport is a Major General Aviation airport with two runways: 10/28 and 17/35. Runway 10/28 is 5,801 feet long and 100 feet wide. Runway 17/35 is 10,000 feet long and 100 feet wide. 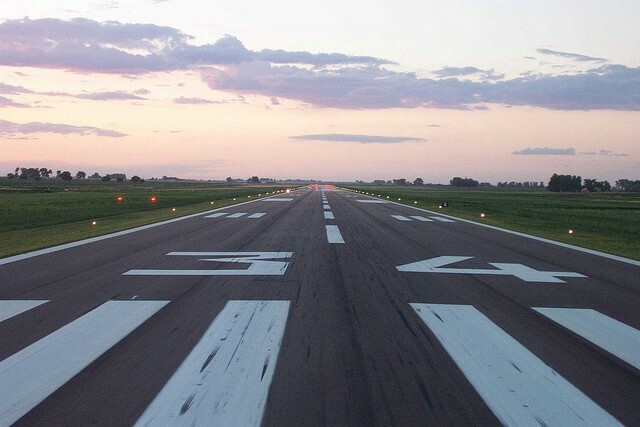 The airport is equipped with very high frequency (VHF) omnidirectional range (VOR), instrument landing system (ILS), Global Positioning System (GPS), and Non-Directional Radio Beacon (NDB) as navigation aids. The airport also has a total of 224 total based aircraft including single-engine aircraft, multi-engine aircraft, jet aircraft, and helicopters. The airport is also a co-location for the Air National Guard. The Northern Colorado Regional Airport (FNL), which opened in 1964, is jointly owned and operated by the cities of Fort Collins and Loveland. 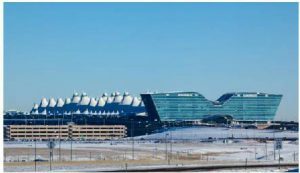 The airport is one of 14 commercially certified airports within Colorado and operates under a limited Federal Aviation Regulation (FAR) Part 139 certificate. This Regulation establishes operation procedures for commercial service. The airport has two runways – 15/33 and 6/24. Runway 15/33 is 8,500 feet in length and has a width of 100 feet. This runway has an asphalt surface with high intensity runway lighting. Runway 6/24 is 2,273 feet in length and 40 feet in width. This runway has an asphalt surface, but does not have any runway lighting. The airport is equipped with a VHF (Very High Frequency) Omni-directional Range (VOR), an Instrument Landing System (ILS), and a Global Positioning Satellite (GPS) as navigation aids. Flight operations at the airport include air carrier, private charter, corporate, air ambulance transport, aerial fire suppression, flight training, and general aviation usage. The airport also has 245 based aircraft including single-use aircraft, multi-use aircraft, jet aircraft, and helicopters. 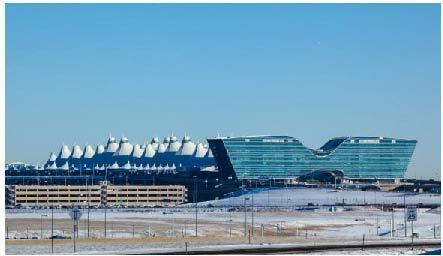 While not located within the NFRMPO region, the Denver International Airport (DEN) is the largest and closest commercial airport serving the region.